My husband, the athlete... or is he ? s it’s getting close to ski season (yay), I’m going to attempt to shed some light on flying to the USA (from Australia) and within the USA with your ski gear. Someone told me a long time ago that if you ski, your ski boots are the most important piece of equipment, and that if you travel to ski, skis you can rent, but your ski boots need to come with you. That was one of the reasons I invented a wheeled ski boot bag (the SkBoot bag), because if you’re travelling, especially from overseas, you’ve normally got a suitcase full of other bulky winter clothing, and there’s just not enough room for boots, helmet, ski pants etc etc. Also, the SkBoot bag is great for once you get to your destination. Why schlep those boots, helmet and gear to and from the lodge when you can wheel them? And, it’s great for day trips to other ski resort. So in order to assist travellers planning their North American ski trip and to prevent any nasty surprises, I phoned most of the major US airlines to find out what their policy was for ski gear and the costs involved. Sadly, I did not anticipate that this brilliant idea of mine would be such a mammoth and frustrating task, and that waiting on hold for long periods of time and voice activated navigation systems usually drive me to drink! In addition, there’s the added challenge of the voice activating system not recognizing an Australian accent! Before I begin, let me stress that the “agents” I spoke to were supposedly the “go to” person for baggage policy (as they answered the phone), but it appeared they didn’t really know what their aline policy was, so bearing that in mind, depending on the person you are dealing with at the check-in counter, the rules might change. But don’t be afraid to kick up a fuss and tell them you checked their website etc etc. If you fly to the USA on Qantas and then connect to an American Airlines flight, “Qantas’ baggage rules will apply”. If, however, after you arrive in the States on your International flight and then fly say, Delta and not AA to your ski destination, they MAY and probably will charge you for checked luggage. Don’t be afraid, though, to say that you’ve just come off an international flight, as that sometimes works. So bearing in mind that Qantas baggage rules apply when flying AA, you would be allowed 2 bags at 23 kgs (or 50lbs) each which would allow you one checked bag and a SkBoot bag for your boots, helmet and other ski accessories. This saves you a lot of room in your other checked bag for other bulky items one needs for an overseas ski trip. If you are travelling Business or First Class, your baggage allowance increases to 3 bags at 32 kgs each – so no worries there. American Airlines told me (September 13 2013) that if you arrive on a Qantas flight from Australia, you do not have to pay for checked luggage on a domestic flight. BUT for Americans flying domestically on American Airlines, the fees are $25 for the first checked bag and $35 for the second, including a ski boot bag, which they say must be 45 linear inches and not exceed 23 kgs (50lbs) and that you should not have more than a pair of ski boots in it, and get a load of this, a pair of bindings! What are you going to do with ski boots and bindings? Anyway, I know it takes a lot of energy for people to come up with these silly rules, so we’ll let that go for the time being. Therefore, you’re better off packing a SkBoot bag to the hilt with all your ski gear, including your boots, helmet, pants, accessories, shell, thermals etc. and packing another bag as carry-on. That way, you will only pay $25, and you’ll have a very practical and super stylish bag that you can use every day to transport your gear from the lodge to the slopes! Anyway, when I finally explained what a ski boot bag was, she said that the rules were the same as above (AA): $25 for the first bag and $35 for the second. I asked if she was sure because I had been led to believe that ski boot bags were not charged for. And she said “you can call back if you like and speak to an agent.” And I said, “Well, who are you then?” And she said…wait for it….”An agent”! At that moment, I felt like Ally McBeal wanting to put my arm down the phone line to throttle the “agent”. So, then I asked if I could be put through to someone in International Baggage, but she said: “I’m sorry, but I can’t transfer calls”. You’ve gotta be kidding! For overseas visitors, if you fly from Australia with Virgin Australia, and then fly domestically in the USA with Delta, Virgin Australia baggage rules apply, which means that you can take 2 bags at 23kgs (50lbs) for each person. So my advice here is the same for those travelling Qantas/American Airlines. And we know what they are, so my advice is: fly Virgin Australia and make sure you have a VA followed by the flight number on your ticket. It can save you a lot of money once you get to the USA. After my experience with Delta, I was too scared to call the other major airline carriers, so went online to see what the policy for checked bags is. Sadly, it’s the same as the other airlines. First bag = $25 and second bag $35. Sidebar: I’m thinking what they mean is that one item of ski equipment can be two pairs of skis with poles and a ski boot bag with just a pair of boots in them. And is that one pair of boots or two? Gosh, I think I have to call them. L Wish me luck. Breathe!!!!! Breathe!!!!!! United Airlines is clearly an airline that does not want to speak to you! I went to “contact us” and there’s a window that pops up that says “Ask Alex”. Alex is not what she appears. She is a robot! So when you ask a question, and if it’s a little complicated, she short-circuits and starts sending you links to their website. And then, if you ask to speak to a person, she sends you more links. Do you think she was offended when I just clicked on the little x at the top right hand of the box? So, back to the “contact us”, after another 10 minutes, I finally found a number, but I don’t think the person who answered the phone spoke English but he transferred me to reservations. But before I could get through to a person, I went through the number sequence and then the final option was say “yes” or “no”. After saying “no” 6 times, and even spelling it and then putting the word “bloody” before it, I finally got through to an agent. Yay! The agent actually was very helpful, but I realised that she was just reading what I had read and that her interpretation was a guess at best. In summary, the agent for UA said that you can take two skis with equipment being poles and bindings, and a ski boot bag with a pair of ski boots which accounted for one item. So my question to her was, “well, if you are allowed two pairs of skis and poles, can you take two ski boot bags with a pair of boots in each and count them as one item?” And she said “yes”. I’m sure this is not correct, and I think it means that if you take one pair of skis, poles, bindings (although I’m sure they are normally on the skis), helmet and a bag with a pair of ski boots (nothing else), this is considered one item. This one item is considered checked luggage at $25. Again, my advice is fill up your SkBoot bag with all your gear (except skis, because you’re going to rent those right?) and carry on your other luggage. That way you’ll pay $25, and let’s face it, if you’re paying $100+ for a ski lift ticket a day, what’s an extra $25? “If applicable, the first or second checked baggage service charge applies to ski equipment. Ski equipment in addition to the baggage allowance will be assessed at the excess baggage charge applicable in the market for a single piece. That’s all about as clear as mud! Ahhh…love Southwest Airlines! Got pretty much straight through to a representative (or agent) who spoke English and there’s great news for travellers who ski! You can take 2 bags as checked luggage for NO CHARGE!!!!! (as long as they weigh less than 50lbs each). And one can be a ski boot bag filled to the brim (again under 50lbs). OR, you can take a ski boot bag, skis (as long as they are in a proper container and packed properly) and one carry-on, and you won’t pay anything. However, if you have 3 checked items, the third item will be $75! Why would you fly any other airline in the US if you can fly Southwest? And just as a note, their in-flight service is better than the others I have flown, in my humble opinion. And finally, a word of warning to travellers who fly Delta. I once asked a flight attendant for a cup of boiling water (because I take my own tea bags, and if you’ve ever tried American Lipton tea, you’ll know why). Never again! She reacted like I’d said she was fat! Goodness, even the guy next to me said “ooh..she was nasty”. Anyway, happy flying, and I hope that I have been able to save you some time when preparing to travel to the USA for your annual ski vacation. And trust me, it doesn’t get better than skiing in the USA and Canada! The number of resorts are astounding, the people lovely, the resorts top-notch, and I believe that this year, the snow is going to be AWESOME! 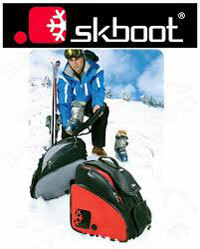 At Skboot our passion drives us to design and develop a range of alpine products and accessories like no other. We know what it's like to be a small business in the world of BIG business and we want to help others get their alpine products out there. View our shopping page to see the amazing ski and snowboard products, created by people with vision and guts, available through Skboot! Copyright © 2019 www.skboot.com | Joomla! est un logiciel libre sous licence GNU/GPL.